This baby & toddler roll-edge crew-neck pullover with ice cream cone motif is a basic drop-shoulder design in cotton yarn with a simple color-work graphic suitable for beginners in intarsia. The striped sleeves add a fun and colorful element to the simple design. 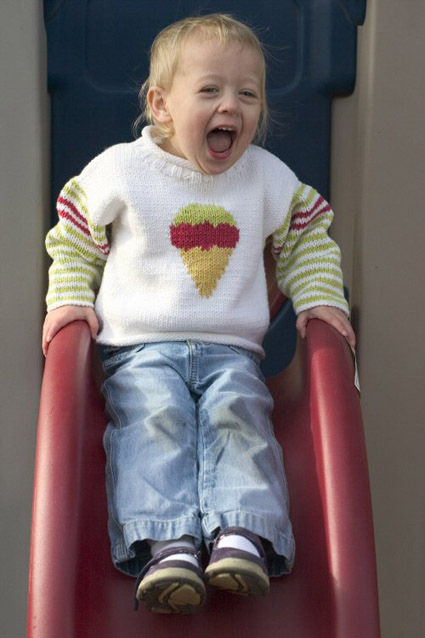 The photo model is 2 yr old Ruby Jane, (whose favorite food is ICE CREAM!) and the photo was taken by her uncle Dave Fennema on a recent visit to Maine from California. NOTE: Shade #183 Jaunty has been discontinued, though it's still available in some yarn stores. If you can't find this shade, #203 Giddy makes a softer, sweeter alternative, or try a yarn like Katia Mississippi or Phildar Aviso. The pattern instructions make a somewhat cropped sweater. If you desire a longer sweater, work additional rows before beginning ice cream one motif. Remember to buy additional yarn if making a longer sweater. Row 1 [WS]: P2, [k2, p2] to end. Row 2 [RS]: K2, [p2, k2] to end. [Work 2 rows CC2, work 2 rows MC] twice. [Work 2 rows CC3, work 2 rows MC] twice. [Work 2 rows CC2, work 2 rows MC] until work is desired length. Using smaller needles and MC, CO 45[55, 61, 65] sts. Work in stockinette st until work measures 1.25 inches, ending with a WS row. Using larger needles, continue in stockinette st until work measures 2[3, 4, 5] inches, ending with a WS row. Next Row [RS]: K14[19, 22, 24], place marker, work Row 1 of chart over next 17 sts, place marker, k to end. Cont in stockinette st, working sts between markers according to chart, until all rows of chart are completed. Remove markers and cont in stockinette st until work measures 7.5[9.5, 10.5, 11.5] inches, ending with a WS row. Next Row [RS]: K18[22, 24, 25], place rem sts on stitch holder. Repeat these 2 rows twice more. 12[16, 18, 19] sts rem. Cont in stockinette until work measures 10[12, 13, 14] inches, ending with a WS row. Replace 18[22, 24, 25] held sts of right shoulder on needle with RS facing, leaving 9[11, 13, 15] center sts on stitch holder. Using larger needles, continue in stockinette st until work measures same as front to shoulder, ending with a WS row. Next Row [RS]: BO 12[16, 18, 19] sts, k20[22, 24, 26] (there will be 21[23, 25, 27] on right needle), BO rem 12[16, 18, 19] sts. Place rem sts on stitch holder. Sew back to front at right shoulder seam. Using smaller needles and MC, with RS facing and beg at left front edge of neckline shaping, pick up and k 12 sts (approx. 4 sts for every 5 rows) along left front neckline, k9[11, 13, 15] held sts from front neckline, pick up and k 12 sts along right front neckline, k21[23, 25, 27] held sts from back neckline. 54[58, 62, 66] sts. Work 6 rows in 2x2 rib. BO all sts LOOSELY, using larger needle. Sew back to front at left shoulder seam. Beginning at shoulder seam and measuring along side edge, measure 5[6, 6.5, 7] down front and back of each side; mark these points with safety pins. Using larger needles and MC, with RS facing, pick up and k 45[53, 61, 65] sts (approx. 3 sts for every 4 rows) between pins on left side. Decrease Row [RS]: K1, k2tog, k to last 3 sts, ssk, k1. Work 3 rows in stockinette stitch, working Stripe Pattern as set. Repeat these 6 rows 4[5, 6, 7] times more. 25[29, 33, 33] sts rem. Cont in Stripe Pattern until sleeve measures 5.25[6.25, 7.25, 8.75] inches, ending with a WS row. Using smaller needle, work 1.25 inches in Stripe Pattern, ending with a WS row. Work measures 6.50[7.5, 8.5, 10] inches. BO all sts loosely. Work right sleeve in the same way. Sew side and sleeve seams. Weave in ends. Gail Pfeifle has been a needle worker since the age of 10 and has been a crazed knitter of baby and toddler sweaters since the birth of her first grandchild, Ruby, in August 2003. 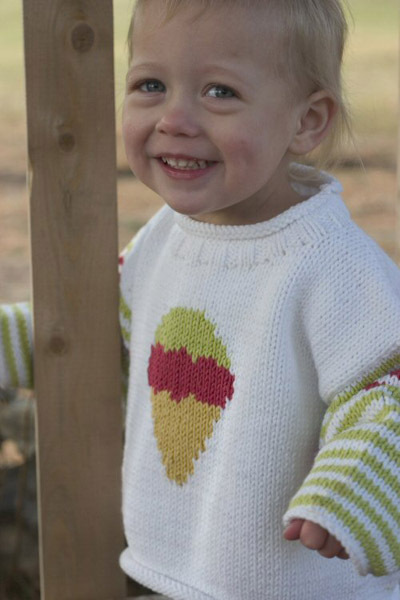 After making the first dozen sweaters for Ruby (most before she was even born), Gail became a passionate designer of her own motifs and patterns for kids' sweaters and named her pattern design collection, Roo Designs, after her inspiration, Ruby (or Roo). 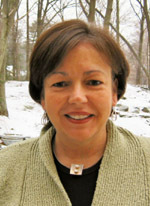 Gail brings many years of fine arts study to the creation of her colorful and fun motif designs.